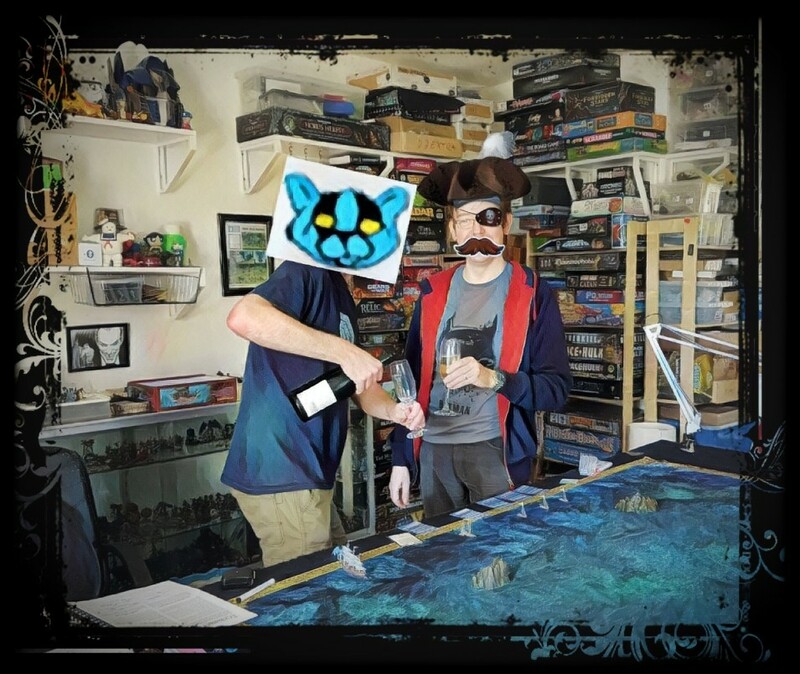 Commodore Cheetor & Admiral The Bazpaz swab themselves with grog. 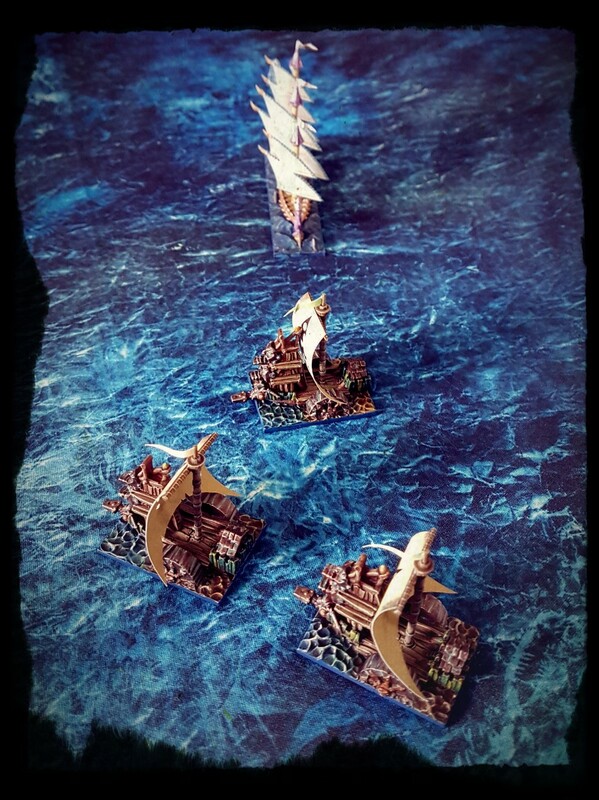 The Bazpaz worked on a fleet of elven ships in advance of our first MoW get together, and it was that fleet that faced off against The Seventh Sons in three games. Random photos from the games follow. Due to a communications issue, Nurgle in fact granted back passage to The Black Stool, much to the dismay of the hawkships launderers. 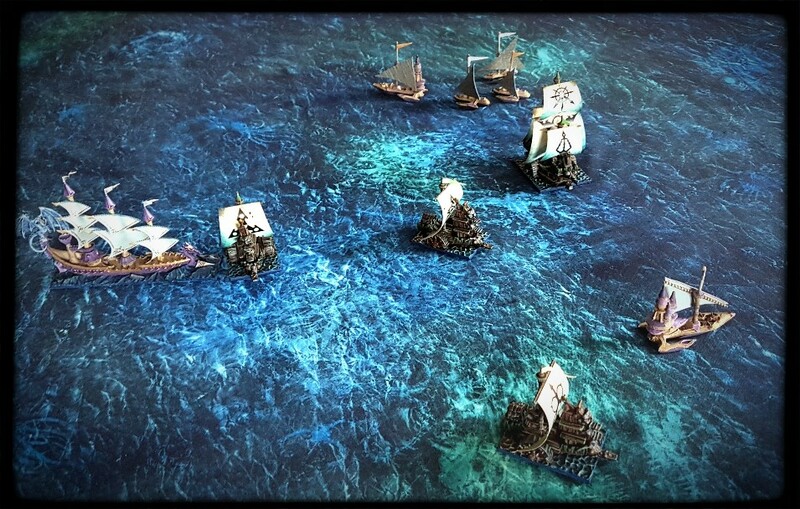 After a long period of preparation for a new game, that moment where two newly painted forces are set up opposite each other with some new terrain is worth savouring, even if the fleets are currently somewhat bijou, and we used hardly any terrain. Boom! Crunch! Splash! Scream! etc is the sound of the approaching elven dragonship, the “Studio Fifty-Four”. 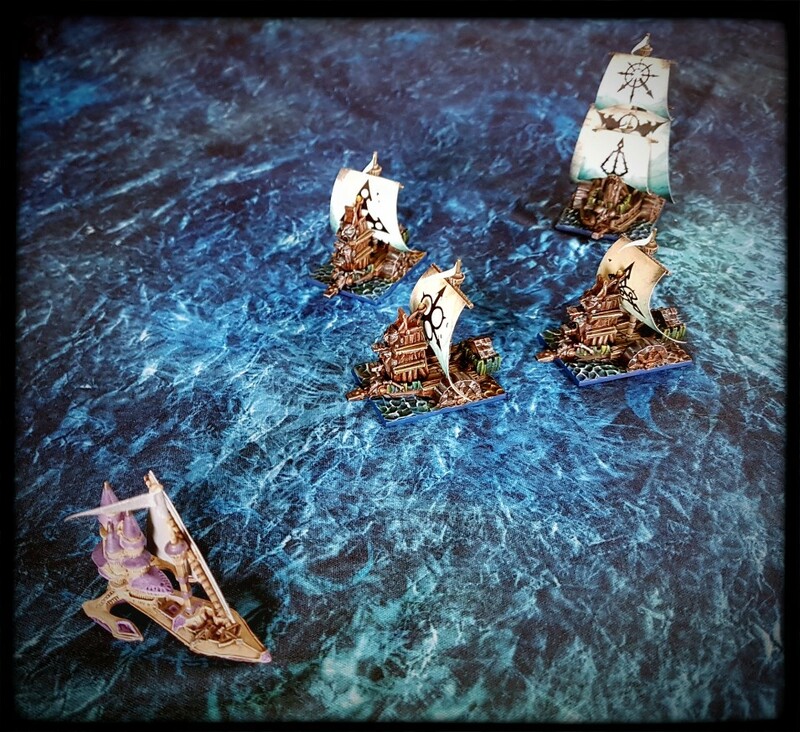 Four Seventh Sons vessels close on an isolated Eagleship. I couldn’t face taking a photo of what that scene looked like after the “Studio Fifty-Four” had moved it’s lightsaber like prow through that Plaguecrusher squadron. “Crumbs Gerald!” cried the countess from her boudoir in tower B3, upon seeing terrors of the deep surface to fight, Harryhausen style. 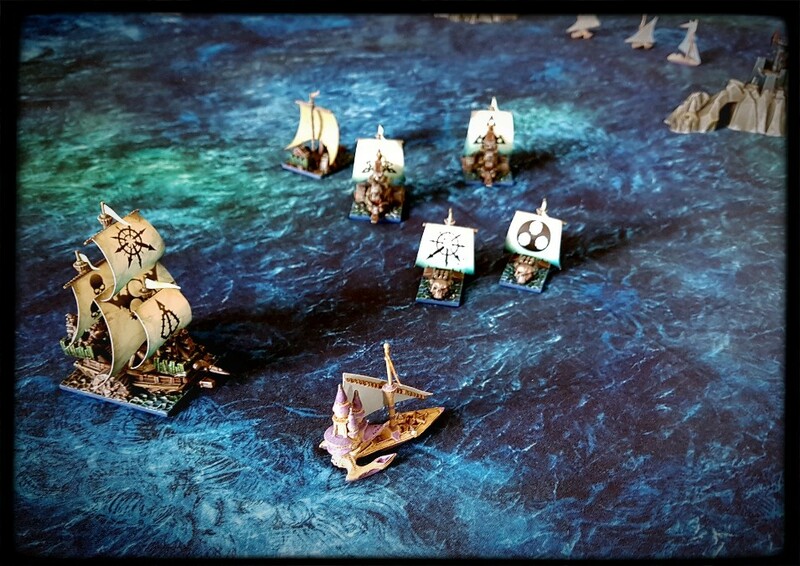 Like an overweight child between bullies who throw his hat back and forth, the plague fleet struggles to hold the elves to account. One of the more pleasing moments of the weekend, when a magical whirpool cinematically held the “Studio Fifty-Four” in place. 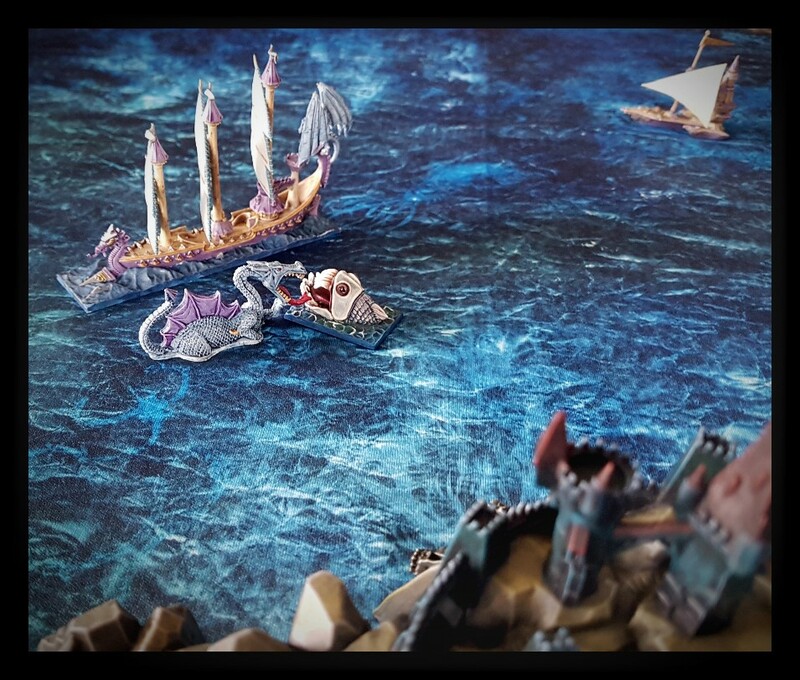 Dragonships are jerks. 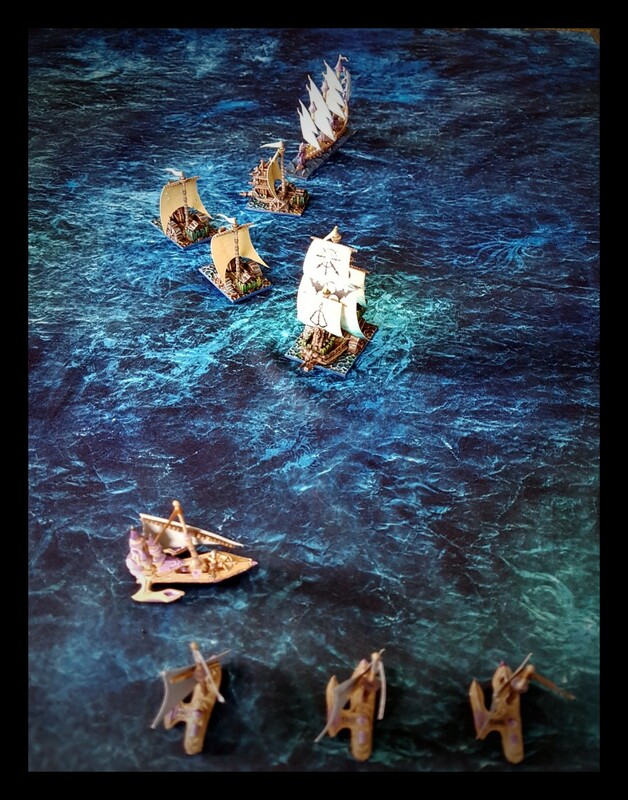 “Oooh, I’m liking this!” chortled Captain Turds-Eye, as the fleet encircles the limping eagleship. A magically summoned fatberg, dismissed as a non-threat half an hour earlier, manages to connect with the “Studio Fifty-Four”. 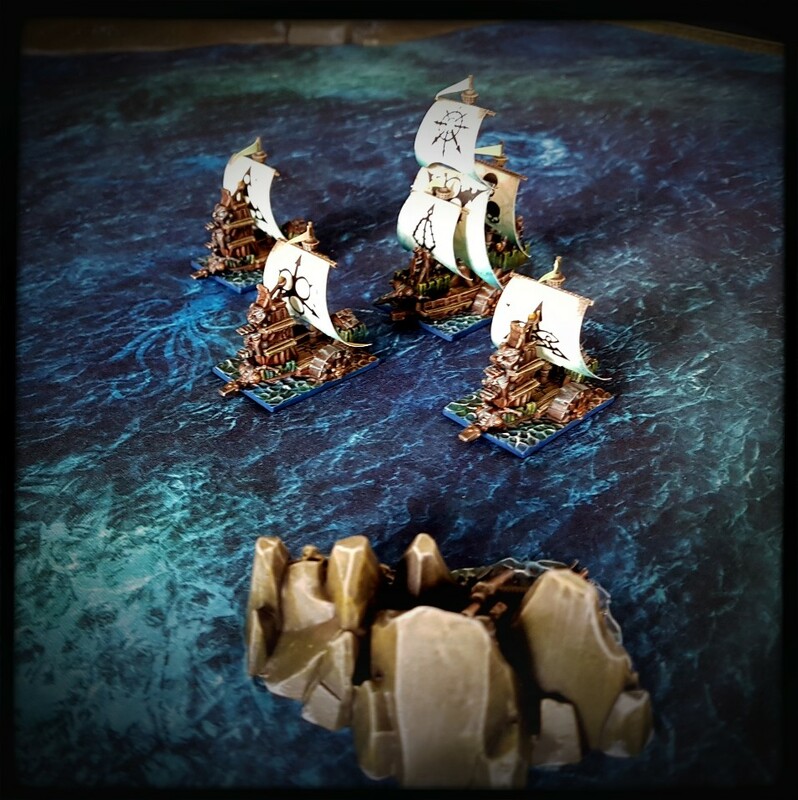 My laughter would have been much louder had my Chaos Warriors not accidentally left their flagship undefended and subsequently scuttled while searching for treasure on Castle Island. Sigh. I be a-blamin’ the grog. Looks like a great day. I love the playing surface with the period border, very fancy. Thanks Will, it was fun. 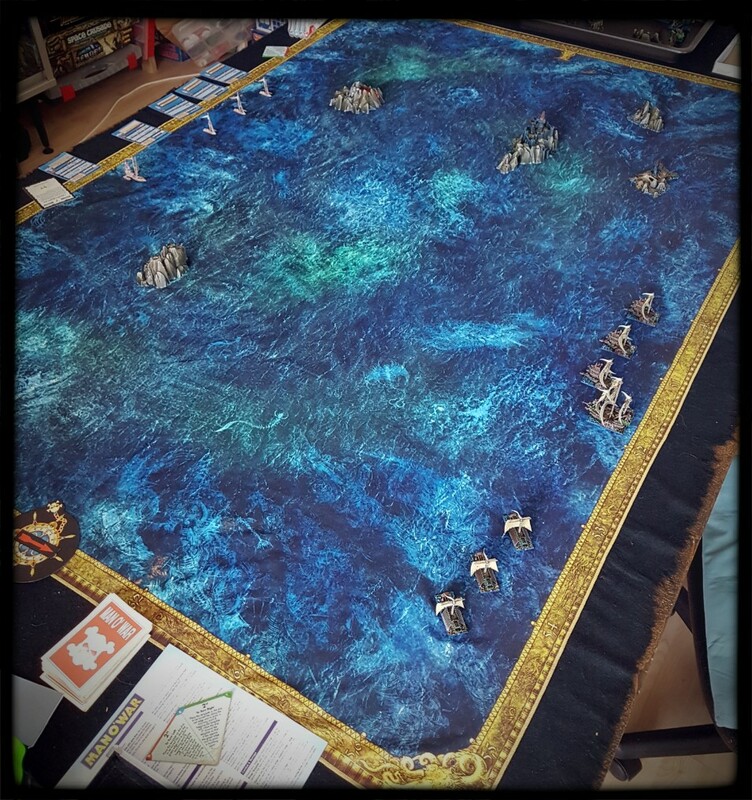 The playing surface is the mat from Dreadfleet. It’s pretty good. It looks nice and doesn’t crease easily, although it is a little light and inclined to shift if leaned on etc. It adds nicely to the theme though. I can almost taste the salt and hear the gulls fighting over the aftermath. 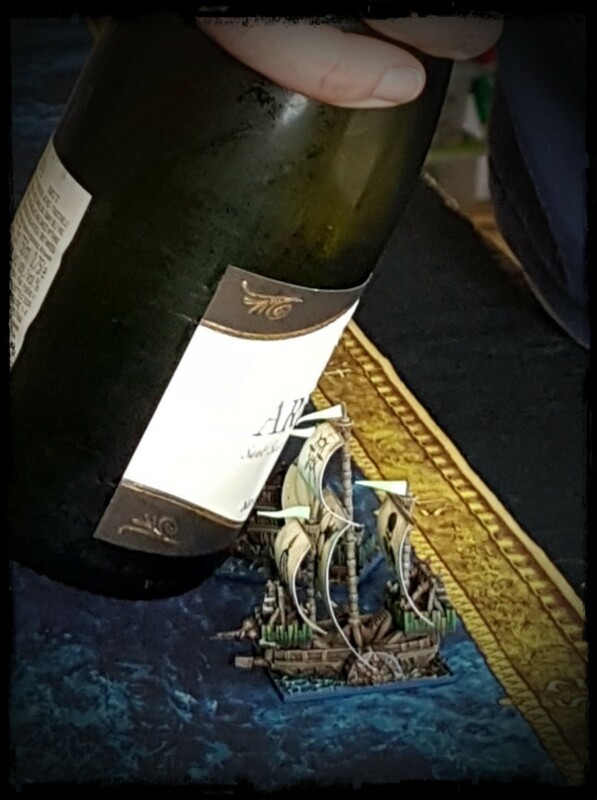 Lovely teeny ships from both of you. Well worth the efforts, and I look forward to further tall tales of derring do on the high seas! I’m glad that the affair comes off as briny axiom, the them is the thing after all. 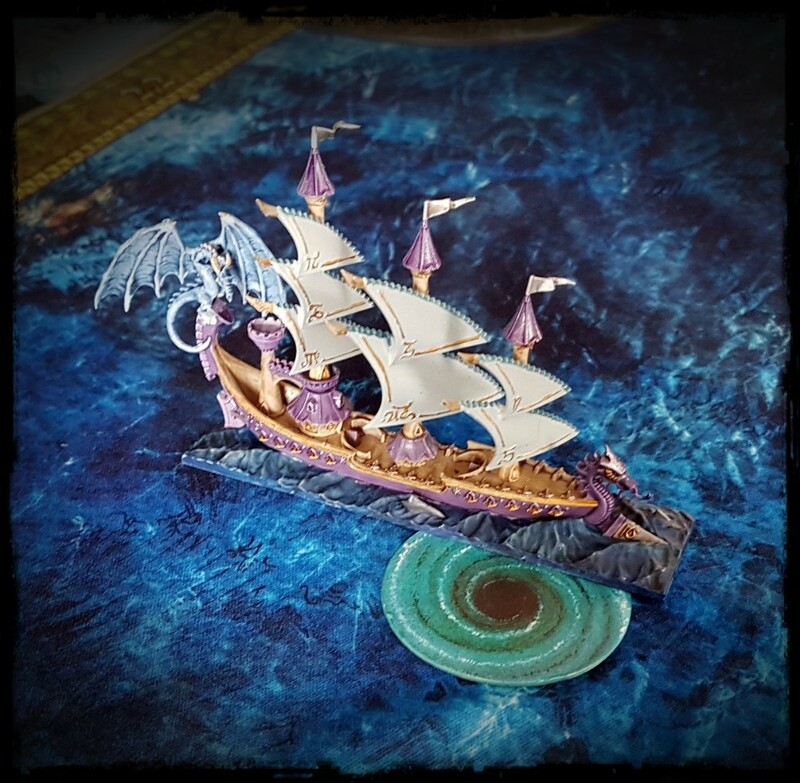 Since this game The Bazpaz has literally tripled the size of that fleet, so there should be many future tales of the Seventh Sons being sunk to come. Lovely looking battle(s). Hopefully the poncy elves were crushed but good. And meme-fish is a welcome addition to any photo. Meme Fish is enjoying her z-list celebrity status, and is available for weddings, barmitzvahs and supermarket openings. The elves proved to be canny, fast and very lethal. This project has been a bit more focused than most of mine, with very clearly defined stages to get to this point. Wrapping up stage one like we did was very satisfying. Great to see this project bear fruit. Those descriptions had me chuckling. The source material is dealt with with the love and respect that it deserves, but never precious. Delicious. 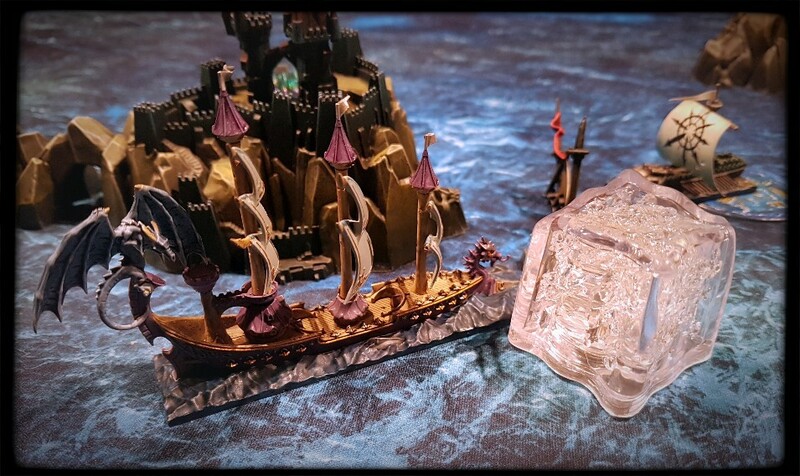 Another beautiful gaming set piece. 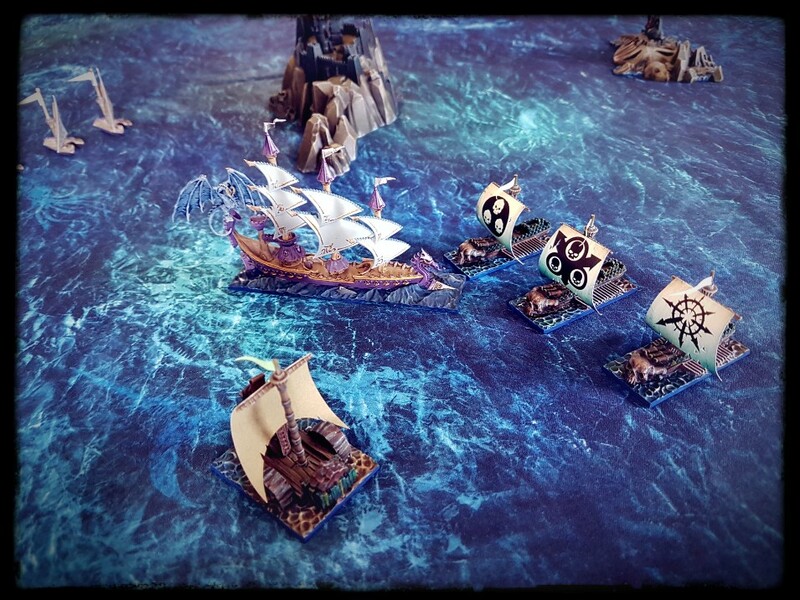 It looked like a laugh, though I am even more fearful of the elven navy now. We will have your big, scary shark exploring Michael Bay soon I hope. As for the elves, bring a change of underwear. This is marvellous. I am surprised your caption for the Sea Dragon and Leviathan fighting each other didn’t spin it as them kissing or generally licking each other’s tongues. How restrained. A pop culture phenomenon like Y2K Leviathan must be handled with restraint, or it ends up about as likeable as Budweiser Wassup campaign. Looks like a fun game. Spirited and somewhat chaotic, the way all tabletop gaming should be. Silly fun is taken very seriously around here. 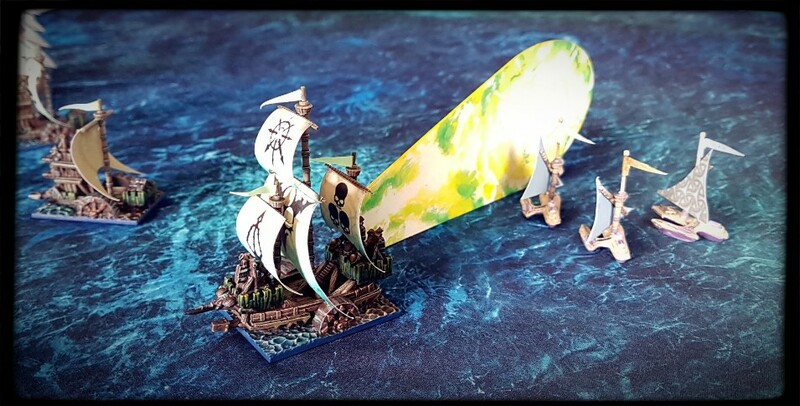 The might of the elven fleets is unmatched on the high seas! I pity all lesser races who are foolish enough to challenge our superiority! I think that you may simply be right Captain. The double move with interrupting shooting is a mechanic that is very difficult to balance correctly in a ruleset I think. I’m not certain that they got it right with the elves… but it’s early days yet. Hopefully we will get their measure. Shiver me timbers! Batten down the mizzen mast! 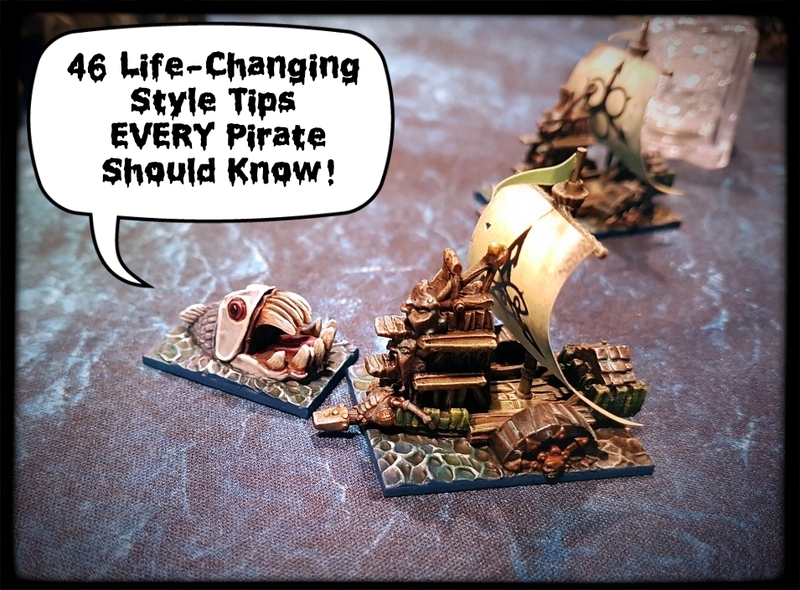 Other nautical sounding phrases in a pirate voice! Great looking games! My poop deck has been thoroughly swabbed by your kind words Sean. An’ if ye not be a-pirate voicin’ when a-playing Man O’War, then ye be doing it and yerself a disservice! Fun, fun, fun, love the pics and the write up. Looks like a very fun game, love this post!